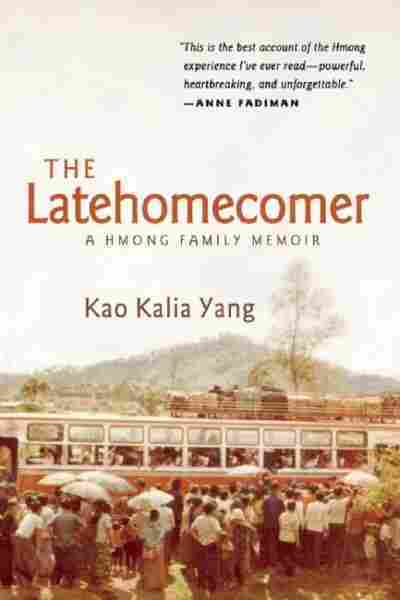 Excerpt: 'The Latehomecomer' Kao Kalia Yang's memoir is both a family chronicle and a history of the Hmong people. From the day that she was born, she was taught that she was Hmong by the adults around her. As a baby learning to talk, her mother and father often asked, "What are you?" and the right answer was always, "I am Hmong." It wasn't a name or a gender, it was a people. When she noticed that they lived in a place that felt like it had an invisible fence made of men with guns who spoke Thai and dressed in the colors of old, rotting leaves, she learned that Hmong meant contained. The first time she looked into the mirror and noticed her brown eyes, her dark hair, and the tinted yellow of her skin, she saw Hmong looking at her. Hmong that could fit in all of Asia, Hmong that was only skin deep. You are going to America on a one-way ticket. You are going to America as refugees of the Vietnam War. You are going to America as Hmong from the camps of Thailand. You are going to America to find a new home. We do not want you here anymore. All this was said in the things that were happening: the classes that her mother and father attended that taught them new strings of words ("Hello. How are you? I am fine, thank you. "); new kinds of food (pieces of chicken between bread with cilantro and green onion and a white, tasteless, fatty spread from a jar); the free set of clothing that each person was given: a dark blue sweater, walking shoes with laces, white socks, dark blue pants, a white collared shirt to go underneath the sweater. These were the Thai government's last gift to the Hmong for leaving their country, the American government's donation to a people who had passed exams stating they had fought under American leadership and influence during the Secret War in Laos from 1960 to 1975. All this was felt as she watched the preoccupied adults around her preparing for a new life, trying to end the yearning for an old one that she didn't know — she saw how their eyes searched the distance for the shadows of mountains or the wide, open sky for the monsoons, one last time before it was gone forever. All these good-byes made her feel very Hmong inside. She had heard stories of how Hmong people did not have a country, how we always had to leave places behind. First China because the Chinese didn't want us on their land — how they took away our written language, and how they tried to turn us into slaves, and so we spoke our fears to our ancestors and made our way to Laos. When the French came to Laos, they climbed the high mountains and they saw the cool of the land. They wanted opium for tax money. We fought them, but lost. When they left they had learned that we would keep fighting, and they told the Americans so. The American pilots dropped first from the sky, injured and scared, into the Hmong villages on Phou Bia Mountain, and we helped them get better again in the depths of the jungle. By the time their leaders came with guns, there were Hmong people who had seen enough Americans to trust in an idea of democracy: a place where we could live with others as if we belonged: a promise of home. Those who believed took up guns. Those who were still only struggling with their lives saw guns pointed at them. The explosion of flesh, the falling down of heavy bodies to the ground, wet blood soaking the dark of the earth. The North Vietnamese soldiers and the communist Pathet Lao soldiers could not and would not tell the difference: Hmong was only skin deep. Skin is easy to penetrate. When the Americans left Laos in 1975, they took the most influential, the biggest believers and fighters for democracy with them, and they left my family and thousands of others behind to wait for a fight that would end for so many in death. A third of the Hmong died in the war with the Americans. Another third were slaughtered in its aftermath. From the clouds, the little girl's spirit watched her family escape into the Laotian jungle, run around in circles for four years, and then surface on the banks of the Mekong River in Thailand --starving survivors. Her spirit came to them in Ban Vinai Refugee Camp. Then her spirit and her body left Thailand — just as the Hmong had left so many other countries. What are you doing here, in America? Are you ever going home again? In the beginning, she did not have the words to say anything. Later, she didn't know what to say. Eventually, she would learn to say, "Hmong is an ethnic minority. We don't have a country. We are here looking for a home." For many years, the Hmong inside the little girl fell into silence. And then one day, the little girl grew up into a young woman. Because she hadn't said very much in her first twenty years, all the words had been stored inside her. Because her people had only been reunited with a written language in the 1950s, in the break of a war without a name, they had not had the opportunity to write their stories down. In the books on the American shelves, the young woman noticed how Hmong was not a footnote in the history of the world. How Vietnam was only Vietnamese. How Laos belonged to the Laotians, and how the war was only American. She saw how the world only knew skin-deep the reaches of Hmong. She saw how they did not know that from the day she was born, she was Hmong. She saw how the children, born in America, lived life like Americans. She saw the diminishing memories of her mother and father on the hard road to remembering the strings of words and the new food in America. She said good-bye to her grandmother from Laos, from Thailand, from America, from the world of the living, and on sheets of white paper. The young woman slowly unleashed the flood of Hmong into language, seeking refuge not for a name or a gender, but a people. 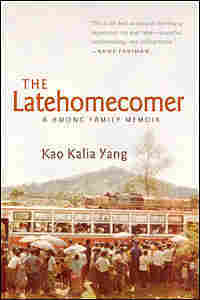 From The Latehomecomer: A Hmong Family Memoir by Kao Kalia Yang. Copyright © 2008 by Kao Kalia Yang. Published by Coffee House Press: www.coffeehousepress.org. Used by permission of the publisher. All rights reserved.